"We only went to this temple because it was not too far from the place we stayed in Air Sanih. But we were so pleasantly surprised at seeing one of the most ornate temples in Buleleng. The walls of the temple are full of beautiful, intricate carving, some of the fine details are still very well preserved. Tranquil and manageable on your own, this is a temple you can spend time appreciating without being harried and pressured by guides offering their services. We came in the afternoon, and we had the temple all for ourselves." The Pura Beji is one the most beautiful temples on the island of Bali and one that is rarely visited by tourists and travellers. 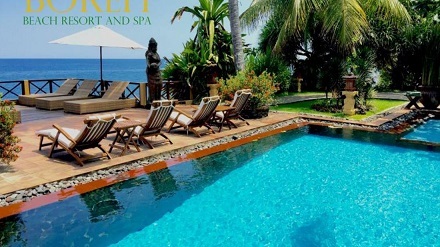 The temple is located in the north of Bali in Sangsit on the way between Singaraja and Kubutambahan. 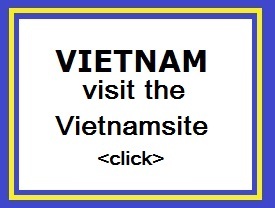 It's around eight kilometres east of Singaraja and if you didn�t know of its location one could easily pass right by it. Look out for the small sign on the left side of the road if you are coming from Singaraja. Follow the dusty path down to the sea. At the entrance to the temple you can rent a scarf and sarong for a small fee. This is mandatory. The temple is not visited very often, but if there is a tour going north, they will visit this temple at the northern tip of Bali. The temple is also known as the Pura Subak. For Dutch people this temple has also a special meaning. The temple was built in the 15th century during the Majapahit period and is considered to be one of the oldest temples in Bali. Being a subak temple it means that it is dedicated to the goddess Dewi Sri who protects the irrigated rice fields. The temple was actually built on the site of a well. 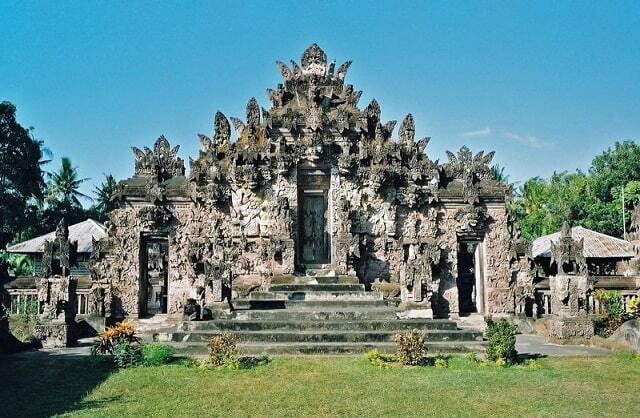 Pura Beji represents a perfect example of the northern rococo style of temple carving, with strange off-angle symmetry. The temple was built of easily carved soft pink sandstone and its walls are decorated with sculptures of demons, snakes and devils. 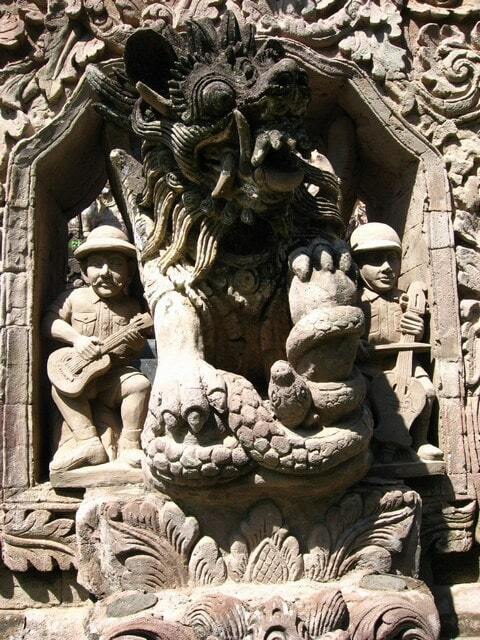 The Candi Bentar (the gate) is amazing and is composed of naga-snakes and imaginary beasts, devils, as well as leyak guardians (monsters). 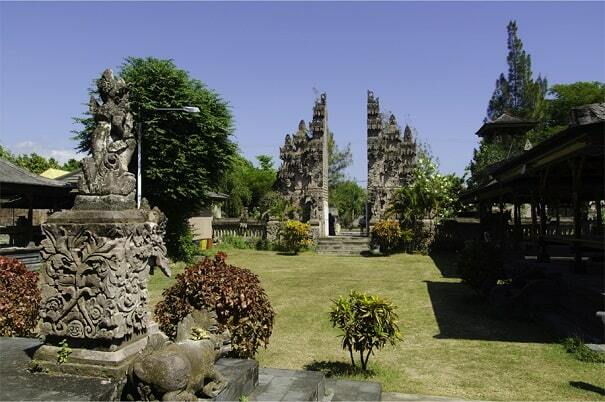 The large courtyard contains ancient Kamboja trees, giving the whole place gives a sense of peace. Here you will find countless homeless small altars, which also exuberantly carved decorations. This contrasts with the temples on Bali Meru (temple tower). Of particular interest are the wooden sculptures and the throne of the sun god. You see everywhere magnificent sculpture, which is typical of Buleleng sculpture. The images are also colourfully painted and that's what this temple is even more unique. At the exit a small donation is requested. The Dutch flavor of this temple is remarkable. Whoever looks carefully will find an image of sandstone two Dutch musicians. One (with mustache) has a guitar and pith helmet, while the other has a stringed instrument and a helmet (?). Subak is a traditional ecologically sustainable irrigation system that binds Balinese agrarian society together within the village's Bale Banjar community center and Balinese temples. The water managements is under the authority of the priests in water temples.